My husband was a happy man last night. :o) He had something yummy like Spicy Sausage Dip to munch on. He doesn't like it so much when I make a bunch of sweets, because he just isn't into sweet stuff...well...except me, of course! Ha! He would rather come home to chips and dips or a meat platter with cheese and crackers. Not cookies, and cake, and muffins. So...to please my honey a little more, i'll be posting more manly dishes, just for my man. 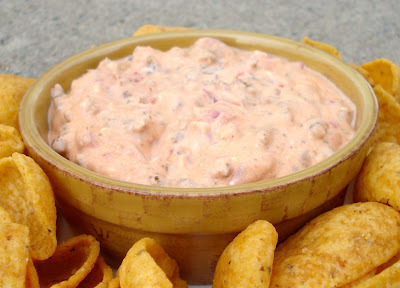 This dip only took a little while to make and then end result was absolutely delicious! What a great little dish to take to a Thanksgiving, Christmas, or New Years party. Brown the sausage, drain fat. Add can of tomatoes and cream cheese and leave on heat until cream cheese is all melted, taste, if it's not spicy enough add some hot sauce. Serve with Frito Scoops, Ritz, tortilla chips...whatever floats your boat. ENJOY! Stay tuned for a fun giveaway tomorrow. :o) YAY! Digi Day...and some exciting news!